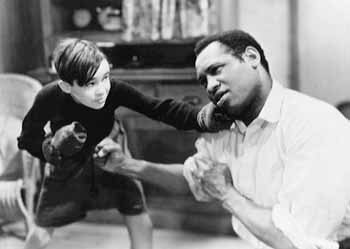 Paul Robeson and Eldon Grant in Big Fella. A British production, Big Fella finds Paul Robeson again working the docks, this time in Marseilles, France. While "lazin'" with his inter-racial coworkers, the police ask Joe (played by Robeson) to help probe the dockside gangs. They hope to find a child kidnapped from a docked passenger liner. After the rich parents offer a 50,000 franc reward, Joe's dock associates eagerly join the search. However, we eventually discover that the child wasn't kidnapped: he ran away to escape the stifling environment of his English upper-crust life and took refuge with a dockside gang of children. Joe finds the missing child and attempts to return him to his parents, but the child resists and tells Joe to leave him alone. If Joe persists, he will tell the police that Joe and his friends actually kidnapped him. Joe relents and puts the child up at his girlfriend's flat. She and Joe quickly become surrogate foster parents for the child. Spike, another dockworker, spots the child in Joe's company and quickly turns him over to the police, collecting the reward. While the child tries to win the reward for Joe, his parents plan to leave on a passenger ship--leaving Joe behind with no money. The child falls into a depression, so the parents entice Joe to come back to England with them and remain with the child, much to the chagrin of Joe's girlfriend. However, Joe realizes his place is on the docks and with his girlfriend, so he remains in Marseilles, swapping Spike (in black face no less) onto the ship. Big Fella was virtually unseen in the United States until the Library of Congress restored a 35mm nitrate print and now KINO ON VIDEO releases this restored version on video. A thoroughly delightful film in the best tradition of British musicals, Robeson and Elizabeth Welch sing several stirring numbers, including "Lazin'," "River Steals My Folks From Me," and "You Didn't Ought to Do Such Things." The film received great critical success for its sensitivity of character and its musical numbers. For the most part, race is refreshingly an afterthought in this film and plays little if no part in the action. The film offers a slightly veiled criticism of the English class structure but never paints the English child's parents as anything but concerned, albeit rich, people. They don't find anything wrong with a black, orphaned dockworker being their child's new nanny and friend. The film really isn't a social commentary piece, however, and only attempts to entertain the viewer with lively characters and memorable songs. To that end, Big Fella is a film not to miss. "The Paul Robeson Centennial Collection" is a new four-cassette video series from KINO ON VIDEO. These videos include Body and Soul (1925), Song of Freedom (1936), Big Fella (1937), and Jericho (1937). Suggested retail price: $24.95 each. For more information, we suggest you check out the Kino Web site: http://www.kino.com. Chris Norton is an editor of Images who received his B.A. in English and Film Studies from Oakland University, Rochester, Michigan and an M.A. from New York University in the Department of Cinema Studies. He currently resides in Manhattan. Chris welcomes comments or questions about his review. You can reach him at norteiga@aol.com.